No matter what kind of event you’re organising, there are few attractions you can hire that will generate laughs and enable your guests to really have fun like our Active Attractions mechanical bulls. 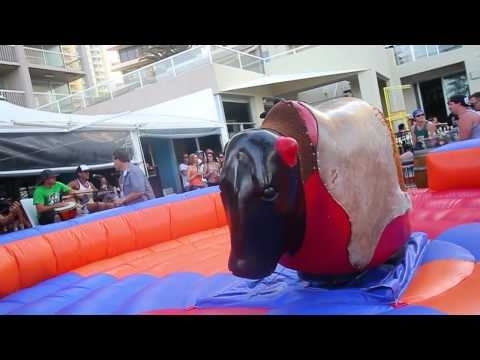 When you book in our mechanical bull hire on the Gold Coast, in Brisbane or in wider Queensland, you are sure to get a ride that is safe, fun and that has been enjoyed by plenty of partygoers throughout the state. 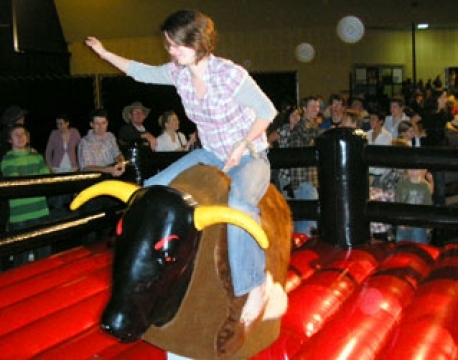 Your guests will be riding a mechanically-powered bull that’s set up on an inflatable and fully safe platform, enclosed on all sides by inflatable padding. No matter how many spills your partygoers take, they’ll come up laughing and ready for another ride. Not only can we provide you with competitively affordable mechanical bull hire, one of our professional and friendly operators will help to set up the ride and ensure that it’s working perfectly throughout your event. To ensure your peace of mind, we also carry $10m in public liability and general insurance. We’re proud to say that this is a genuine on-shore policy. Get in touch with our team at 1800 133 041 and give us the details of your event right away. We’re more than happy to talk with you and provide you with the best possible attraction hire solution. Your guests will be riding high in no time!